The Ministry of Civil Aviation released the revised Route Dispersal Guidelines (RDG), in continuation of what was stated in the National Civil Aviation Policy (NCAP) of 2016. The order, dated 8th August 2016, is available on the website of the ministry. ndia continues to be one of the few countries where airlines have to fly on certain routes without any incentives for the same. Many countries worldwide, notably UK, Australia and Canada have systems in place to incentivize or subsidize airlines to fly to remotely connected or unconnected routes. Some of these ideas have been considered for the formation of UDAN – The regional connectivity Scheme. In the revised Route Dispersal Guidelines, there would now be 20 city pairs which will form part of Category – I. This is an increase from the existing 12. Flying distance of more than 700 kms, average seat factor of over 70% and annual traffic of 5 lakh passengers over two full schedules (one year) is the criteria for any route to be Category – I route. None of the category II routes will get converted to I, only Category III routes can be converted to Category I. The existing list of 12 routes in Category I increase to 20. The effective addition is 10 routes, since two from the existing list are dropped. The requirement for Category II and IIA routes continues as before, which is 10% and 1 % of ASKMs of Category I to be deployed on Category II and IIA respectively. The requirement of deployment on Category III is reduced from 50% of Category I ASKMs to 35%. As per the DGCA data released for October, Vistara deploys 63.3% ASKMs on Category III while AirAsia deploys 363% ASKMs on Category III. Market leader IndiGo deploys 145.3%. All airports in Uttarakhand and Himachal Pradesh are now part of Category II. While Uttarakhand has Dehradun and Pantnagar as operational airports, Himachal Pradesh has Kullu and Dharamshala. Sir, thanks for a lovely article and analysis. It is nice to see you writing on your column again, after quite a bit of a hiatus. The 10 new routes were interesting, as was the current operators on the top routes. Airlines have slightly less than a year to re-jig their network. Given what we know of the fleet additions, do you plan to speculate on which airline might do what? I guess not, for obvious reasons . Airfares going down to woo travellers: I wonder how much this will be offset by the UDAN cess. I dont think any airline will pull out of route which is being categorized as Cat 1. 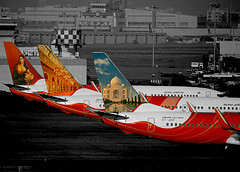 GOI/PNQ - which are moving to Cat I have slot issues and thus releasing any slot is not feasible for any airline.